Undesign the Redline curates a past to present journey of the transformation of place, race, and class in America. 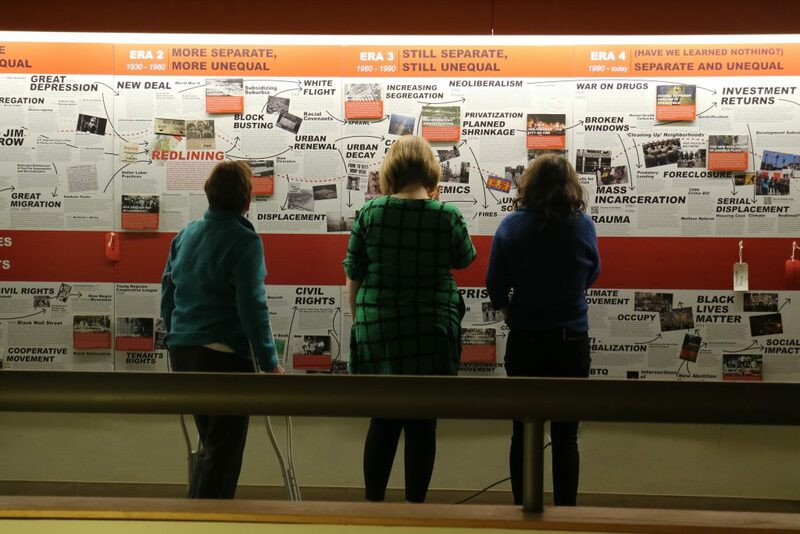 This traveling exhibition explores how redlining and other policies, practices, and investments create systemic disparities and inequalities that not only perpetuate our most pressing social challenges, but impede the full potential of democracy. Introduction: How explicit racism became structural. Redlining: Explore the Homeowner Loan Corporation Maps and area descriptions of local cities – including Hartford, Springfield, Holyoke, Boston, and New York City. Timeline: Where does redlining fit in a history of devaluing and disenfranchisement? How was it combatted by people with another vision for society? Stories from the Line: Hear from the experiences of those affected by Redlining and humanize the lessons of history. Undesign the Line: Learn about alternative models, hear inspirational stories, and participate in inventing the policies, practices and entities that have the power to undesign this legacy. Redlining is the practice of denying loans or services to a person or a community based on their race, class, or ethnic background. During the Great Depression, the Federal Government created a system for evaluating risk in the mortgage market. The Home Owners Loan Corporation commissioned maps for 239 cities and counties across the nation, color coding neighborhoods green, blue, yellow or red to indicate worthiness of financial investment. 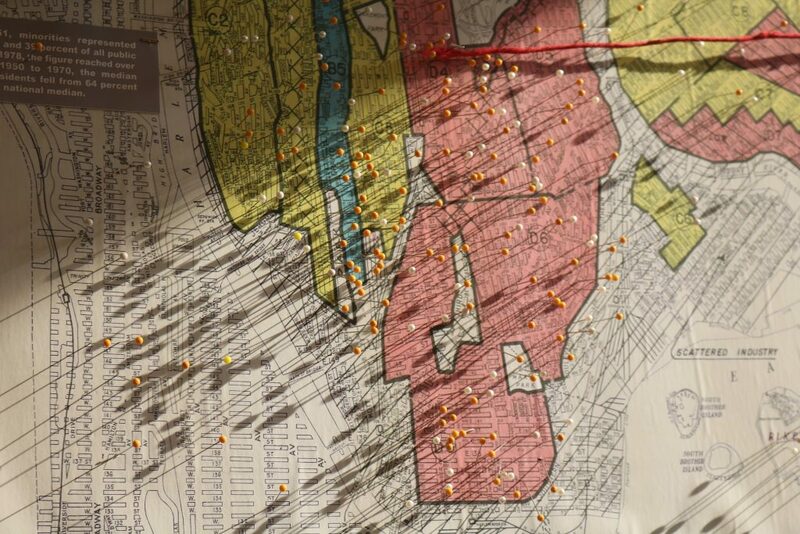 Surveyors were instructed to color those areas they considered ‘hazardous’ in red, due to ‘infiltration’ of ‘detrimental influences,’ such as the presence of Black, Puerto Rican, or foreign-born residents. Redlining demonstrates how the explicit racism of the Jim Crow era was designed into the structural racism that continues to plague cities across the nation. Massive post-war era programs would go on to reinforce these divisions, such as the Federal Housing Administration’s requirement to only insure loans made in “racially homogenous areas” and the targeting of Urban Renewal programs in redlined neighborhoods, which disproportionately displaced communities of color. The devaluation of many communities through redlining resulted in the deepening of segregation and wealth inequality throughout the United States. This is a legacy we are still grappling with today. Coates, Ta-Nehisi.“The Case for Reparations”,The Atlantic, June 2014. April de Simone, Braden Crooks, Charles Chawalko and Gregory Jost. “Building Justice: How to Undesign the Decades of Racial Redlining that Scar U.S. Cities,” City Limits, October 2016. Talk given by historian Nathan Connolly, author of A World More Concrete: Real Estate and the Remaking of Jim Crow South Florida and consultant to the Mapping Inequality Project. Sponsored by the History Department and the Lecture Committee and co-sponsored by Office of Multicultural Affairs and Africana Studies. Panel on Race+Class, Space and Design featuring Designing the WE partners Gregory Jost and April De Simone, in conversation with Joseph Krupczynski, Director of the Office of Civic Engagement and Service-Learning at UMass Amherst and Associate Professor of Architecture at UMass Amherst, Serin Houston, Asst. Prof. Geography and International Relations at Mt. Holyoke College and author of the forthcoming book Making Place in Seattle: The Challenges of Creativity, Sustainability, and Social Justice, and Chris Gilliard, Professor of English at Macomb Community College, author of “Digital Redlining, Access, and Privacy” . 10:30 am Rigged Cities! Healing from demolition, displacement, disinvestment – Community organizers Terri Baltimore (Hill House Association, Pittsburgh) and Denys Candy (Jandon Center for Community Engagement) tell the story of Find the Rivers! – a decade long initiative to transform how residents saw their roles in re-making their neighborhood and Pittsburgh’s future. 2 pm Food Access and Us – Students from Gender, Land, and Food Movements (SWG 230) present on the efforts to undesign food deserts in Springfield and Holyoke. 4:30 pm Work it Out – Interactive community mapping workshop @ the Spatial Analysis Lab. Screening of MAJOR! with Q&A by Professor Jennifer DeClue : MAJOR! tells the story of the remarkable life of Miss Major Griffin-Gracy, Stonewall veteran, Black transgender elder, and activist. The film has earned 19 awards for best documentary, and explores queer and trans struggle, community, and liberation. A discussion lead by Professor Jennifer DeClue will follow the screening. Assistant Professor in the Program for the Study of Women and Gender, Jennifer DeClue’s research focuses on queer studies, black feminism, and visual culture. Her current book manuscript analyzes black feminist visualizations of archives of racialized sexual violence against black women. The creators of the Undesign the Redline exhibit will join us for the closing reception. For more information about events, contact Miriam Neptune, Digital Scholarship Librarian, Smith College. The Knowledgelab is located on the second floor of Neilson Library at Smith College. The Library is open to the public, and groups are welcome to do self-guided tours. Faculty and group leaders should RSVP to bring a class or group to the Knowledelab during library hours.